La Spa Naturale at the award-winning Paihia Beach Resort & Spa brings you totally relaxing Thalgo treatments. La Spa Naturale, at the award-winning Paihia Beach Resort & Spa, will have you in a state of pure bliss and relaxation with their two premier Thalgo treatment packages. These Thalgo packages are an all over body experience that works to destress both the mind and body. Inspired by the islands in the heart of the Pacific Ocean, the Polynesia Spa Ritual sends you on a journey of ultimate relaxation. This 120min treatment starts with an exotic Island scrub with coconut shells, white Bora Bora sand, sea salt and Tahitian vanilla blend to soften and smooth your skin. "The Lagoon water bath pebble is where you can relax in the bath amongst relaxing essential oils that will help you to totally unwind," says Kaycee, a therapist at La Spa Naturale. This is then followed up with a Mahana massage. "This slow and powerful massage is performed with hot sand pouches and the scent of the Tiare flower which is infused in our Mahana oil," adds Kaycee. Finally, Polynesia sacred oil is used. This oil leaves the skin glowing with a subtle pearl finish. Your body will return detoxified, replenished and relaxed. 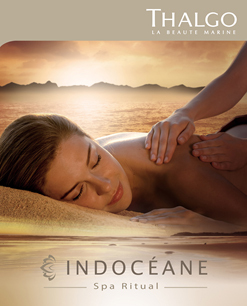 The Indoceane Spa Ritual has been specially designed to relax and unwind as well as leaving the skin healthy and glowing. This 120min treatment includes a Sweet and Savoury scrub with sea salt, cassonade sugar and Mediterranean essential oils exfoliating your body and making your skin feel new. "A precious milk bath with effervescent sugars is where you can lounge with powdery scents, helping you to relax before an Ayurvedic inspired massage. "This is an Indian inspired massage using deep smoothing, tapping and rubbing movements to destress and release tension bringing you to a complete sense of relaxation," says Kaycee. Then finish up with a silky smooth body wrap. "Our warm silky wrap will leave your skin feeling softer, smoother and radiant," adds Kaycee. La Spa Naturale at Paihia Beach Resort & Spa offers you the ultimate in luxurious relaxation and beauty therapy. Their team of expert and professionally trained Beauty, Massage Therapists and Hair Stylists will ensure your visit is both an unforgettable and a pleasing experience.